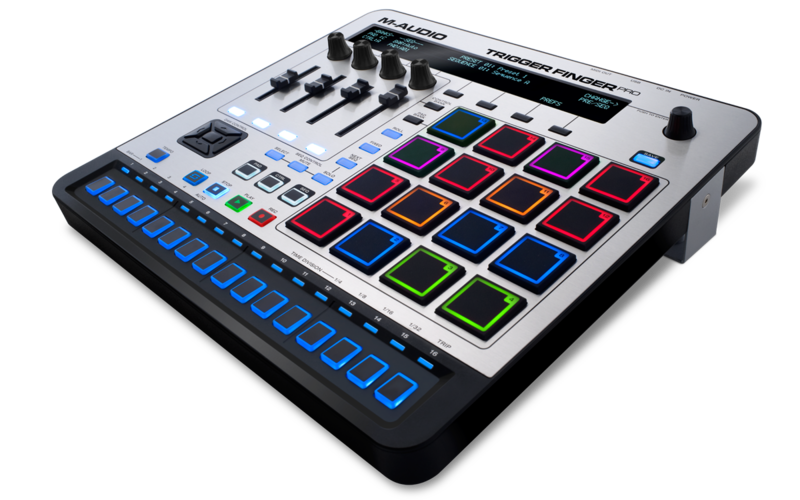 The M-Audio Trigger Finger Pro is a fully encompassed advanced performance and software control station which arms you with a comprehensive music production capability all in one controller. The included Arsenal software integrates with popular DAWs, hosts VSTs, and includes automatic mapping, providing seamless integration between the hardware and software. This article walks through a number of frequently asked questions about the M-Audio Trigger Finger Pro and the Arsenal software. Does the Trigger Finger Pro have presets to automatically control my DAW? Where do I get drivers for the Trigger Finger Pro? What are the minimum system requirements for a computer? What are the specifications on the optional power supply? Can the Trigger Finger Pro control and sync BPM with my hardware MIDI instruments? The Trigger Finger Pro packaging says that it includes free software and samples. How can I get the software? My Trigger Finger Pro shows as 3 separate MIDI ports. What port should I be using for my application? Can Arsenal be inserted more than once in my Digital Audio Workstation (DAW)? Why won't Arsenal open in my Digital Audio Workstation (DAW)? Can Arsenal run third-party plugins? Can the Arsenal software open VST plugins? How can I quickly save my preset and my sequence? How can I tie notes in the sequence together? Why is the Trigger Finger Pro not controlling the Arsenal software when running in standalone mode? Yes! The Trigger Finger Pro comes loaded with presets for Ableton Live, Pro Tools, Logic, Cubase, Sonar, Digital Performer, Studio One. The Trigger Finger Pro also includes presets for MIDI, Mackie, HUI, Major, and Minor Scales. With Mac computers, the Trigger Finger Pro requires no drivers. They are "plug and play". The M-Audio Trigger Finger Pro can be powered by an optional 6VDC -1A – Center Pin Positive power supply, that is not included with the purchase. Yes! The Trigger Finger Pro has a 5-pin MIDI output to connect to external MIDI instruments. The Trigger Finger Pro packaging says that it includes free software and samples. How do I get the software? Register your Trigger Finger Pro at http://m-audio.com/index.php?do=user Once registered you will see all included software titles available for download. Arsenal is an intelligent production hub and advanced content library designed for your Trigger Finger Pro. Use the intelligent content filter parameters to find the sound you need, quickly. Arsenal integrates directly into popular DAWs, but can also be run in standalone mode. The latter lets you utilize VST instruments without firing up your DAW and is ideal for software- based stage performance. Finally, Arsenal's interface lets you map the hardware controls visually, making customization and workflow a breeze. Absolutely! Arsenal can be added to as many tracks as your computer processor will allow. Arsenal is a 64-bit program only. If you are running a 32-bit operating system, Arsenal will not open or function as expected. Yes! Arsenal has the ability to run VST and AU plugins and can be instantiated into your DAW as a VST, AU or AAX plugin as well. Arsenal can also act as a VST 'wrapper' while instantiated as an AAX plugin in Pro Tools - ultimately allowing VST plugins to function within Arsenal while working within Pro Tools! How can I quickly save both my preset and sequence? Holding down the Save button for 2 seconds will save both the preset and the sequence. While in Sequence mode, press multiple Sequencer Step buttons simultaneously and they will be played as one sustained note. Night Mode illuminates steps 1, 5, 9, and 13, so you can easily detect the down beat in low lit areas. Why is the Trigger Finger Pro not controlling the Arsenal (Standalone) software? If this is your first time using the Trigger Finger Pro with Arsenal (Standalone) you will need to activate the MIDI ports so the Trigger Finger Pro is able to communicate with the Arsenal software. Also make sure that Preset 01: Arsenal is selected, and loaded on the Trigger Finger Pro. In Arsenal, click the Setting icon (the gear) to open the Settings window. Click the I/O Settings button to open the Audio/MIDI Settings window. Under Active MIDI Inputs, make sure the option labeled Trigger Finger Pro MIDI is checked. Click the circle next to the option to check it. Close the Audio/MIDI Settings window and Settings window.